Bicycle commuters are often in a battle with drivers for space on the road. [Hammock Boy] does all of his commuting on two human-powered wheels, and is quite interested in not getting hit by a car. He decided to ply his hobby skills to build a device that helps keep him safe. It’s not just a tail light, it’s a sensor that shines brighter the closer a car is to the back of the bike. The sensor portion is the ultrasonic range finder seen in the center of the protoboard. Surrounding it is a set of LEDs. Each is individually addressable with the whole package controlled by an Arduino. The sketch measures the distance between the back of the bike and whatever’s behind it. If there’s nothing, one Red led is illuminated. If there is an object, the lights shine brighter, and in different patterns as the distance decreases. Certainly the next iteration could use a standalone chip without the need for the whole Arduino. This could even work with two battery cells and no voltage regulator. We also think the use of any other color than Red LEDs is suspect but we do love the concept. A couple of years back [Bryan’s] iPod went on the fritz. It wasn’t completely broken, as long as he kept it really cold it still worked. So what was he to do with the crippled device? We’ve all heard of elevator music. [Bryan] decided to invent refrigerator music. First he needed some speakers. A trip to the Goodwill store netted him a pair for under $5. 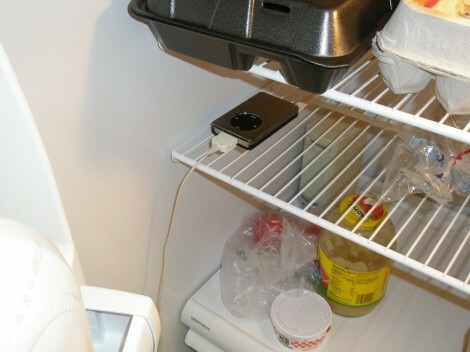 They need A/C power, and the project depends on sensing when the door to the refrigerator is open. He killed two birds with one stone by adding a light socket outlet adapter. This provides a place to plug in the speakers’ power adapter, and it only gets juice when the door is opened. The gimpy iPod just constantly loops through the tracks stored within, but you’ll only hear it when the door is open and the speakers receive power. Of course the iPod will eventually run its own battery down so [Bryan] ran an extension cord out the side of the door to a wall outlet. This interrupts the door seal and we wish there were another way to keep it contained within. 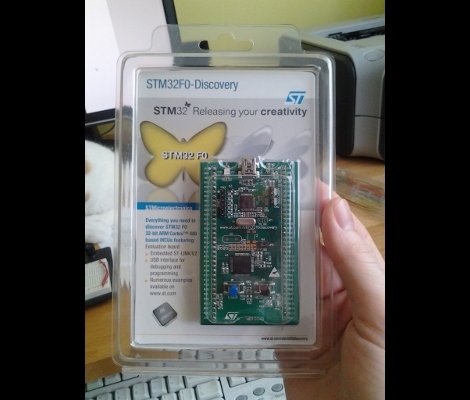 Last Wednesday I posted a video review of the new STM32F0-Discovery board which is built around an ARM Cortex-M0 chip. I speculated that it should work with the open source project aimed at programming these discovery boards. I tested it out and a connection could be made, but no code could be flashed. So I spent a few hours over the weekend and added support. My updates are already in the stlink repository. After cloning the code, you can use three commands to compile the software (./autogen.sh, ./configure, make). That’s assuming you have all of the necessary dependencies (I had to install libusb-1.0-0-dev) and that you add the udev rule suggested in the documentation (also found in the repository). The program st-util connects to the board and provides a listening port for an ARM debugger (I’m using arm-none-eabi-gdb from CodeSourcery G++ Lite). When I first started testing, the chip id was reporting as 0. It turns out the register address polled for this information was wrong. After finding that in the almost-900 page reference manual I went through the painstaking process of finding the hex values necessary to properly memory map the device. From there I also updated the blink example to generate an ELF file compatible with the Cortex-M0 chip. So out of the gate you should be able to use an ARM cross compiling toolchain to compile the example, connect to the board with this utility, then use the debugger from the toolchain to connect and flash that example to RAM. There’s lots more to be done. To fully utilize the chip it is necessary to use a startup file and linker script when compiling. I’ve done nothing in this area, but I hope to work on some tutorials as I get further along. Of course if you have your own successes developing for this board using a Linux machine we want to hear about it! If you want to improve the reliability of your electronics, just cover them in silicone or epoxy. Potting, as this technique is called, protects your project from impact and loose wires, but most of the time ends up as a gloppy mess. [Charles] figured out an awesome way to make pro-looking potted electronics using silicone and a few supplies from the emergency room. On one of [Charles]’s trips to the ER, a nurse put Tegaderm on a wound and he noticed his skin could breathe. Figuring Tegaderm would also allow silicone to breathe, he asked for a sample and went back to the lab. 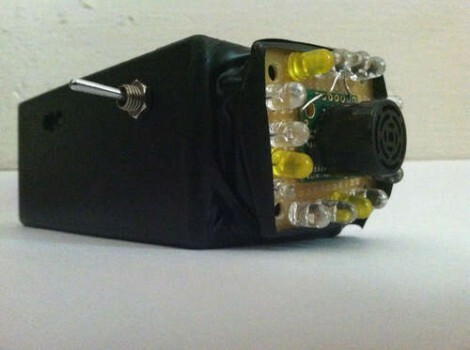 After putting a few globs of silicone on a PCB, [Charles] wrapped the whole thing in Tegaderm. Much to his surprise, the silicone cured and made a smooth, glossy protective covering on his board. [Charles] put up a Picassa album of his Tegaderm/silicone potted electronics, and we’ve got to say they’re looking very professional. This technique could also be applied to [Charles]’ glass PCB touch sensor, allowing for the creation of clear (or at least tranlucent) PCBs. After the break, you can check out [Charles] potting his ATtinyISP board in silicone with Tegaderm. One word of warning, though: don’t use a silicone that uses acetic acid to cure – that’s a death sentence to electronics. Luckily, there’s an easy test to see if your particular brand of silicone produces acetic acid while curing. Just squeeze a bit of silicone on a piece of scrap, and if it smells like vinegar after a while, don’t use it.